A double cabochon is particularly rare. Estimate: HK$6,000,000  8,000,000/US$770,000  1,000,000. Photo: Christie's Images Ltd 2011. HONG KONG.- Christies, the worlds leading auction house for the sale of extraordinary jewels will present its spring sale of magnificent jewels on 31 May at the Hong Kong Convention & Exhibition Centre. With a pre-sale estimate exceeding HK$550 million/US$70 million, this auction will offer collectors close to 300 pieces of rare diamonds, fine coloured gemstones and exceptional jadeite. Leading the sale is The Imperial Cushions, a pair of spectacular ear-pendants featuring the worlds rarest diamonds from the legendary Golconda mines. This seasons spotlight falls on a pair of D Potentially Flawless Golconda Type IIa diamonds ear-pendants  The Imperial Cushions, with an estimate of HK$55 million  75 million/US$7 million  9 million (Lot 3296). The occurrence of such a pair of Golconda gemstones, with a limpidity that is particular to the worlds finest Type IIa diamonds, is a natural marvel. At 23.49 and 23.11 carats each, this pair of cushion-cuts is of exceptional calibre  matching in size, cut and shape, and represents a true jewel of majestic proportions. With Type IIa diamonds representing less than 2% of the worlds production, this superbly matched pair of The Imperial Cushions is a unique example of magnificence and rarity. While the present diamonds do not actually come with an imperial provenance, the quality, workmanship, size, and rarity are certainly of a caliber worthy of a royal collection. The heart-shaped diamond is a modification of the round brilliant cut and represents the highest level of difficulty in its make. This sale will offer a pair of 13.09 and 12.86 carat heart-shaped diamonds ear pendants, which flaunts very good polish and symmetry resulting in the most proportionate balance of sparkle and brilliance within the stones. (Lot 3294, estimate: HK$23,500,000  35,000,000/US$3,000,000  4,500,000). Again, this pair of diamonds is Type IIa, D colour with internally flawless clarity which delivers a manifestation of perfection. This pair of ear pendants also represents the largest pair of this quality ever to appear at auction. Type IIa diamonds are the most chemically pure form of diamond lacking in nitrogen which therefore yield exceptional optical transparency. Therefore, this kind of diamonds has been being sought-after by many collectors for years. Another highlight is an un-mounted 18.88 carat D colour, flawless clarity brilliant-cut diamond (Lot 3289, estimate: HK$25,000,000  40,000,000/US$3,200,000  5,000,000). With the certification from the Gemological Institute of America, this diamond is also determined to be a Type IIa. In this Spring sale, Christies will offer a range of important sapphires from top sapphire producing regions including Kashmir and Burma. Of note is a pair of 14.84ct and 13.37ct cushions-shaped Kashmir sapphires and diamond ear pendants (Lot 3275, estimate: HK$20,500,000  30,000,000/ US$2,600,000  3,800,000). This pair of sapphires is superb example of the fabled Kashmir material with the ultimate desirable cornflower blue colour, the hallmark of the auspicious Kashmir mine. This rich blue is homogenously distributed throughout the stones and the expert cutting allows for many internal reflections to be observed. They possess a high clarity, which provide a superior degree of transparency. The combination of all these characteristics in these gems is indeed rare in natural Kashmir sapphires of this size. Another sapphire highlight is a pair of 10.16 and 10.09 carats oval-shaped Burmese Sapphires and diamond ear pendants (Lot 3212, estimate: HK$3,600,000  5,500,000/US$450,000  650,000). Exhibiting the classic Burmese royal blue hue, these gems are extremely well-matched and strikingly rare given their size and quality. Among the ruby highlights is a pair of 5.23 and 5.13 carats oval-shaped Burmese ruby and diamond ear pendants (Lot 3278, estimate: HK$13,500,000  20,000,000/US$1,700,000  2,500,000). Without any heat treatment, these two rubies possess the most desirable pigeons blood red colour. They exhibit a well-saturated colour combined with a pleasant cutting style. Natural Burmese rubies of this quality represent a great rarity and its combination of outstanding characteristics is a very exceptional treasure. To source one natural saltwater pearl is a feat in itself nowadays. A three-stranded necklace composed of 143 white natural pearls with lustrous quality will be offered in this sale (Lot 3258, estimate: HK$9,600,000 15,000,000/US$1,200,000  1,800,000). The size of these 143 white pearls on this necklace measures from 2.5 to 12.8 mm, spaced by diamonds and suspending a drop-shaped natural pearl. 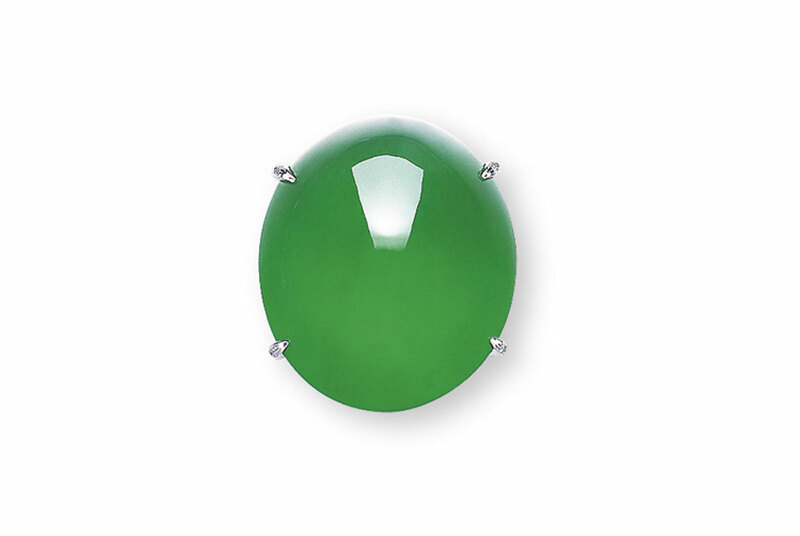 Cabochon is the most simple and common cut of jadeite, yet it is difficult to find a superbly oval jadeite cabochon with superior colour, translucency, and texture. A double cabochon is particularly rare. The ring of Lot 3282 (estimate: HK$6,000,000  8,000,000/US$770,000  1,000,000) is set with a 13.5mm thick double cabochon perfectly rounded on both sides. In spite of its thickness, this precious cabochon is of exceptional translucency and purity, with even green tone and without any trace of impurities. Other jadeite highlights include a milefo and diamond pendant (Lot 3263, estimate: HK$4,500,000  6,500,000/US$575,000  800,000), set with a well carved jadeite laughing buddha of brilliant emerald green colour and high translucency. This Buddha is a natural jadeite and no polymer is detected. Another of note is a suspending carved jadeite disc necklace. This carved jadeite disc is of brilliant emerald green colour and high translucency, depicting two dragons flying amidst clouds, representing the rebus may your son have a brilliant future and be blessed with success. (Lot 3283, estimate: HK$4,800,000  6,500,000/US$600,000  800,000).